Te Anau and Manapouri are passionate cycling communities. We naturally attract people to live here who have a love of the great outdoors and being fit, so many garages are crammed with bikes. There are plenty of opportunity to cycle here, whatever your abilities. One of the big benefits about living in Te Anau and Manapouri is that they are largely flat, and because there isn't much traffic it's easy for families to get around by bicycle in relative safety compared with other towns. As well as getting to Te Anau shops by bike, a gentle cycle route is to cycle north from the main street along the lake front and keep going onto a gravel track that takes you further along the lake front to the mouth of the Upukerora River. From there you can either loop back via roads, or return on the same off-road route. There is also a fantastic mountain bike circuit in Ivon Wilson Park. See our Parks page. There are some fantastic longer distance road cycle routes around Te Anau and Manapouri on quieter, often gravel, roads and suitable therefore for mountain bikes. The Borland Road south of Te Anau and Manapouri winds its way into Fiordland National Park and up and over a pass to a remote part of Manapouri Lake. More information can be found on the Department of Conservation website. Another option is the Mavora Lakes area to the east, accessible from the Mossburn-Te Anau highway, which has a gravel road travelling all the way north to Lake Wakatipu. This region is outside Fiordland National Park but is in conservation land and very beautiful. Closer to town, it is possible to cycle from the entrance to the National Park on the shores of Lake Te Anau down a gravel road travelling south on the eastern bank of the river Waiau. The most obvious long distance road route from Te Anau is the Milford Road, which takes cyclists into Fiordland National Park although this is recommended for experienced road cyclists only as it is also heavily travelled by coaches and campervans and does not have a separate cycle lane. Annually, the road hosts the Milford Classic cycle race. See our events pages for details. "Around the Mountains" cycle route is being built by Southland District Council. The trail will start at Kingston and travel through the villages of Garston, Athol and Lumsden. It then goes west towards Mossburn before heading up to the Lake Mavora area, through the Von Valley, to Mt Nicholas Station and ending at Walter Peak Station on the shores of Lake Wakatipu, where it is then possible to catch a boat back to Queenstown to complete the circle. The Fiordland Trails Trust is campaigning for more trails for bicycles, horses and walking in the Te Anau and Manapouri region, including connecting Te Anau and Manapouri by trail. 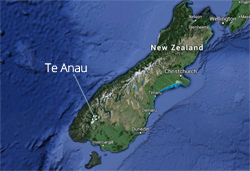 Get in touch with Te Anau Cycling Inc, Te Anau's pro-active cycling club right here in town. They organise club rides, time trials, and fun family cycle rides, and publish maps of cycling routes on the Te Anau Cycling Inc website. If you need to rent a bike, you can rent from our wonderful bike hire facility, Fiordland Bike Hire, which is located at the Mini Golf Course on Mokonui street, just off the main street, and just one street back from the lake front. This fantastic facility rents a variety of fun bikes, including an bike that seats multiple people in a circle! You can also rent bikes from Outside Sports, a shop close by on the other side of the main street.